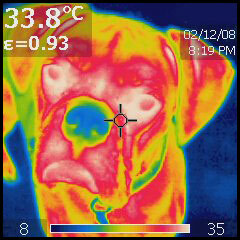 WCTI are happy to provide the thermographic equipment and knowledge to veterinary applications. Patients will be equilibrated correctly beforehand and the presence of a vet with the appropriate physiological expertise will be requested. The principle of veterinary thermography is clear: infection or injuries activate the animal bodies’ natural resistance mechanism. This is marked by a movement of energy throughout the tissue, which is manifested through higher blood flow and reflected in the surface temperature. In addition, edemas can be traced as pathologically cool zones on the body surface. Not only damage to tissue, but also overload on certain joints have an impact on the blood flow, resulting in higher surface temperature. 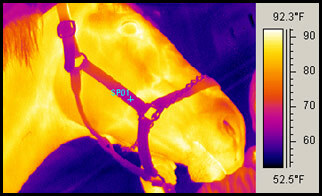 Infrared imaging is particularly helpful with difficult to detect problems such as non specific lameness. Because there are so many different diagnoses to be made, finding the source of a problem, ensures that the correct treatment can take place from the start. 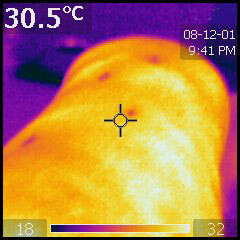 The thermal camera can confirm whether there are heat anomalies in the leg or hoof, whether there is excessive heat possibly indicating an abscess, or cooler areas, often the symptoms of poor blood flow. The Thermogram shows a hot spot on the back and saddle area indicating Back and Body Problems and Saddle Fit should be checked. It is very often the case that a symptom that shows up as pain in the back for example actually has its root cause somewhere else for instance the foot. The horse will very often compensate for the injury by transferring its weight to the other leg, causing twisting and undue stress along the spine. Traditional methods of diagnosis would be to treat the back, give physiotherapy treatment or rest the horse. By doing a scan of the entire body, areas that are showing abnormalities in temperature can be easily identified and the relevant areas of the horse given suitable treatment. This often alleviates the secondary symptoms, in this example the pain in the back. This photo shows the Rocky Mountain Wood Tick on a domestic dog. In British Columbia, ticks attach themselves to large animals such as deer, cattle, dogs, sheep and humans. The wood tick is a known carrier of spotted fever, tularemia, and causes a disease in man and animals called tick paralysis. Complete recovery occurs when the tick is removed if paralysis has not progressed too far, but death may occur. Thermal imaging can help find the ticks before it is too late. These images show hoof imbalance, a common problem. Note the increased heat in the lateral right front where the breakover is across the right quarter and toe. In identifying the physiologic imbalance in the hoof, appropriate shoeing changes can be made to improve performance and hoof comfort.